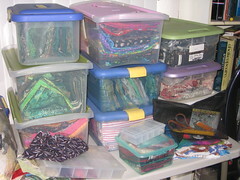 The only thing of note I did yesterday besides play GuildWars was work on reorganizing my fabric. I bought some new storage boxes, which I desperately needed, the other day, so I had some room to pack away some of the stuff that's just been sitting around. (This is NOT all of my fabric, by the way.) I did pick out stuff that I really don't like, or just don't think I'll ever use, and start making a pile of stuff to get rid of. There's a whole big box full already.